In nanotechnology, tiny particles are used. The uncontrolled release of fine dust or nanoparticles can be hazardous. For this reason it is necessary to protect human health and the environment from adverse contact with these materials – applying DAS technology. by their large surface area. Desired effects can be achieved with this, such as the well-known lotus effect, or the vast current-carrying capacity of carbon nanotubes. For the treatment of waste gases occurring in systems that handle nanoparticles, DAS Environmental Expert offers the electrostatic dust collector product family EDC. Electrostatic Filters use the electric field to remove particles from the waste gas. The systems of the DAS Environmental Expert GmbH, especially the electrostatic dust collector EDC, have been developed to treat also fine and finest particles. 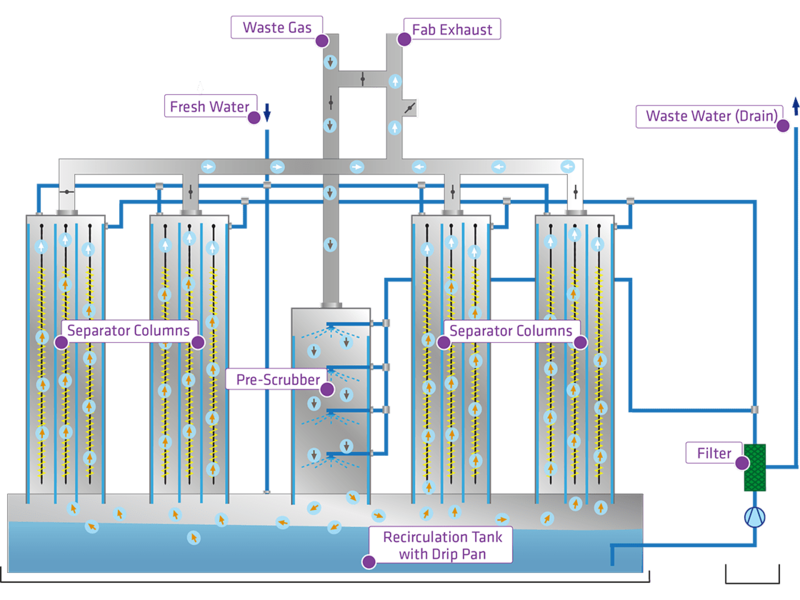 The waste gases are introduced in a pre-scrubber and following in a tank which is simultaneously storage tank for the scrubbing liquid. The pre-scrubber is equipped with nozzles, which saturate the gas flow with water, and create a turbulent flow. Afterwards, the waste gas is channeled into the electrostatic dust collector tube, where the contained micro and nanoparticles are ionized and precipitated in a grounded water film on the water wall. The filtered fine dust is suspended into the scrubber solution.